Antiques challenge. On the last day on Natasha Raskin and Philip Serrell's road trip, they cover Berkshire and Hampshire. Browse content similar to Episode 20. Check below for episodes and series from the same categories and more! -I don't know what to do. ..with £200 each, a classic car and a goal to scour Britain for antiques. The aim - to make the biggest profit at auction. But it's no mean feat. Back in the game. Charlie! or the slow road to disaster? 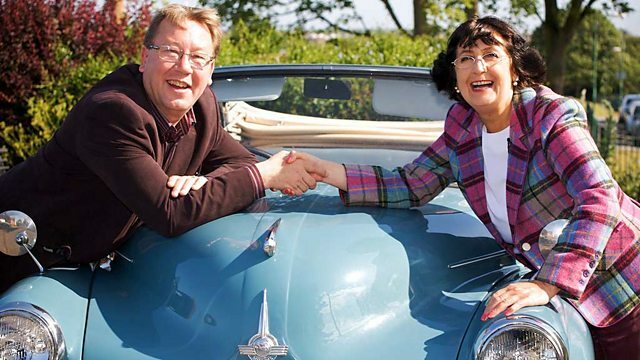 -This is the Antiques Road Trip! for Natasha Raskin and Philip Serrell. I don't know how to tell you this but I'm in love with you. -Well, do you know what? -You don't seem too moved. You seem quite throwaway, casual about this. Well, you know, it happens all the time. who loves to lead the way. -I am of course the captain of this ship. Longest way up, shortest way down. is still learning all the Road Trip rules. Away from the pots, away. Oh, they're so shiny. and their competitive spirit is alive and well. might just sneak another Road Trip under his belt. and do something stupid like buy a sheep. a few losses along the way now has her total sitting at £165.64. he's now in the lead with a fabulous £325.40 to spend on this last leg. -our last auction. Isn't that sad? -That is a bit sad, isn't it? It's a bit weird as well because I've got used to it now. Well, we'd better make this a good one then. Our two experts started out in Narberth in Pembrokeshire. they're kicking off this last leg in Eversley, Hampshire. First stop today is Eversley Barn Antiques. -Hello. Hi there. Hello, you must be Hilary. I'm Tasha, lovely to meet you. -Hi, Philip. How are you? You have got a very tall barn full of stuff here. Everyone's looking for something different so you have to have it all. -We've all got different eyes. -Which way are you going to take yours? -I don't know. That way? -Are you going to go upstairs or...? -I might just sneak outside. Ah. OK, I'll stay in. I'll leave you to it. You've obviously spotted something. While Phil hijacks Hilary, Natasha heads upstairs. Oh, this looks good up here. Yes! In the attic. A bit more my cup of tea. Tile-top coffee tables, modern. Yes, I'm into this. but I love this cellarette. but keeping it cool in a cellarette. So a mini wine cellar. This looks more like a plant pot holder or jardiniere to me. early-20th-century so we'd expect that. Oh! How did I not notice that? but it's what I want to spend. I want to make a profit at the end. As does Phil. Spotted anything yet? -That little rocker's sweet, isn't it? -So this is what, 1950s, is it? And it's got this... little piggy and the bunny rabbit. That's quite sweet, isn't it? You've got 30 on it. What could you do that for, Hilary? I'm selling that for a friend, so probably about 24. -I knew you were going to say that. Hilary, I think that's lovely. I'm going to buy that off you. -I'm going to buy that. So, that's the first lot bought on this final leg. Hopefully Natasha is faring well back inside. I love revolving bookcases and this looks like a really nice one. and it revolves, so let's check out... Oh. It's a little bit stiff actually. It's not quite got that slick... No. It's actually a bookcase that's a tale of two stories, really. with dodgy plastic casters that everyone is trying to forget. because that's probably reflected here. "Revolving bookcase", 55 quid. So, it's not quite a revolving bookcase. It's a book case that revolves, if you know what I mean? Uh... I think so. Another possibility. I think they're fun things. There'll be one or two uses. Actually... I'll just work this out. Aren't those a cool set of shelves to hang up somewhere? -Brilliant. Yeah, they would hang on a wall. ..those are going to make £60 or £70. On a good day, they might make 120, 130. That's what I think. if I could. I really like those. A very generous £75 off the ticket price. to probably the 1930s or '40s and they're novelty. The dog lovers would like them. But they're quite sweet. in one fell sweep... One fell swoop! Ah! It turns out the jardiniere is marked "EBA" too. They're all owned by the same dealer. will Natasha try a cheeky offer for the three? All together 75, but that's my opening gambit, Hilary. -We know how it works. If that's possible because we do like to make a bit, a little bit. -because that's still a massive chunk off. -If you're cool with that, I'm cool with that. A great deal for three interesting items. Well done, Natasha. Does anything else grab you, Phil? This is just an interesting tray. It's late 19th century. It's in mahogany. Now, there's two issues with this. it's completely and utterly out of fashion. would have been between £200 and £400. This is now priced up at £55. What's it going to make at auction? so I've got to try and buy it for around £20, £25. Cor. Better get your bartering head on, old bean. I'm hoping I can try and buy it off you for around the £20 mark. -It's the condition really, isn't it? -Yeah, go on, you're an angel. -So, Phil's also bought three lots in the first shop. from shopping and has headed 20 minutes south to Aldershot. Samuel Franklin Cody, who became Britain's first aviator. -And there's the man himself. He's looking pretty dapper, isn't he? Some style. My goodness! because he modelled himself on Buffalo Bill. because that was HIS surname, was it not? It was, but Cody changed his name from Cowdery to Cody. -Ah, to be more like Buffalo Bill? His dates are a wee bit later than Buffalo Bill's, is that right? They are. He's much younger than Buffalo Bill. training horses and working the cattle trails across Texas. But, by the 1880s, the Wild West was disappearing. Cody followed with one of his own. Cody's act of the West is Cody himself. -His horse, his lasso, his gun, his pistol. -Oh, wow. A one-man Wild West show. and, out of the limelight, he was becoming fascinated with aviation. he designed the aeroplane that would see him fly for the first time. In this period, we are behind the Americans. and the French are also getting into the air, so we are behind. Oh, no. And as an American, he must have been itching to get in front. -Ah-ha! Not just an American but as Cody. Cody actually makes his first flight and his first flight is successful. -It's 440 yards, 27 seconds. Ends up with a crash and he gets cuts and bruises but he has flown. often with cash prizes, to help fund his passion. Before that, he was rejected because he was a foreigner. -So, this cowboy is now a Brit? to the local band playing. -You see, Cody did it very quietly and modestly. for the longest distance round a closed circuit. flew a seemingly unbeatable 150 miles non-stop. Two days left in the year, so he hasn't done it. He doesn't do it? The odds are against him and the weather's bad. But on New Year's Eve he's up very early in the morning. He's striding his lawn in the frosty grass and he decides to have a go. The first three hours, you can imagine, they're monotonous. He's frozen but he continues in this solid progress for three hours. -and he has flown 185 miles. -He's really gone the extra mile. an extraordinary feat many thought impossible. as on the morning of 7 August tragedy struck. and the plane plummets to the ground. The two of them are thrown out and Evans breaks every bone in his body. And it ends as Cody would like it to end - cleanly and in the air. Cody was buried with full honours at Aldershot military cemetery. as the celebrated cowboy and amazing aviator was laid to rest. And so the world bid farewell to one of its most colourful pioneers. ..hoping to uncover something special at his next shop. You must be Will. Phil, Will. Will, Phil. Phil, Will. -What did this use to be then? -It used to be a old meat depot. -My dad used to be a butcher and my grandad. Many people reckon I have it in me. Well, you're built like a butcher, if you don't mind me saying. Like a butcher? More like an athlete. And it's not long before something else catches Phil's eye. I love that. Originally it would have been one of a pair, wouldn't it? -Yeah, off a gatepost, I'd imagine. What's the ticket price on that one? that we had a bit of sort-out this weekend and it suddenly appeared. -Suddenly appeared. Oh, I like this. But I still think it's quite fun. Would a £20 note buy it? -If it gets rid of it, I suppose, yeah. Go on, £20. So, that's a hefty lot bought. Now, how about a pig's trough? -This is cast-iron, isn't it? Pre-war. That's got to be the 1920s, I would imagine. Cos after a while they made them galvanised, didn't they? -Galvanised came in after the war. -How much is that, Will? Well, we did have 75 on it. But what were you thinking? It's going to make 30 - 50 quid at auction, isn't it? It might make a little bit more. I'd have preferred the 50 to 80, really. I've got to give you somewhere between 20 and 25 quid. No, I'd have to have a little bit more than that. -You got your hand out quick earlier. -That's a round 50, isn't it, really? and I'm going to put the two as one lot in the auction. A great bit of bargaining secures another lot. and all I can say is, nighty-night. The next morning, our dynamic duo are back on the road. Well, Phil, our last day of shopping. Do you know, I do think that I've reduced you to my level. -With some of the crud that I've bought. Oh, stop it. You don't know me very well. I've always bought crud. Do you remember where we started off? Woodworm and rust. -but I've bought something with woodworm. -Just to take us back to the beginning. -You see, the Serrell influence is there. -Not always for the good. leaving her £80.64 to spend today. which means he still has £140.40 to play with. where Natasha's hunt for more antiques begins. Go, girl! he's sure to be harbouring some hidden gems. -How cute is your Wemyss pig at the front? -I don't think it is Wemyss though. -I think it's another make. -OK, so in the style of? That would be quite nice. Can we have a look? and sought after Scottish pottery. Let's have a look. Hook the pig. Hook out the pig. which, though generally inferior in quality to Wemyss, is still popular. It's super cute. Look at him face on. He's got a bit of a wonky face, doesn't he? He doesn't have quite the fine execution of Wemyss, does he? -But he does have the look. It's hand-painted, is it not? It is hand-painted and no damage. Oh, Stephan, I think there is a wee bit of damage. -I think there's a wee bit of a curly tail option. -And I'm the one wearing glasses. -I'm just keeping my eyes peeled. are mimicked all the way across her body, her ears, all over the place. -Oh, cos it's quite big. Maybe it is for hatpins. I love this! The more I hold it and learn about it, the more I love it. -so now it's a crisp £10 note. I think I can deal with this little piggy for a tenner. -I think you ought to. Oh, Stephan, that was quick! I wasn't expecting that. I'm glad I spotted her. I'm chuffed. Here's hoping this little piggy makes a profit at auction. home to one of the most famous warships in the world - HMS Victory. and was the vessel where he drew his last breath. Philip's meeting curator Andrew Baines to find out more. -This room that we're in now, this is Nelson's? This is a great cabin, which is divided into four sections. the day cabin, where we are now, and then his bed place. -You can just feel history coming out of the walls, can't you? -Nelson pacing back and forth. at the Battle of Trafalgar she became most famous for. and this is the cooking range? or the lowest of the ratings onboard, the boy seamen. All the cooking is done here. cos we've got a timber wooden ship and a fire in the middle of it. -on a lunch meal of raw pork and wine. so everybody onboard gets exactly the same ration. so he will bring onboard his own pantry of stores, if you like. However, the men here can do just the same. You eat and live as part of a mess, as four, six or eight men. that you will then slaughter and eat as you go through. a good portion of which came from alcohol. and the proof of their rum is about double what we call strong now. into battle against the French and Spanish. It was 27 vessels versus 33.
including the great Nelson himself, who was shot on the quarterdeck. Captain Hardy came to bid his Admiral farewell. He knows he's going to die. He could really, although he's surrounded by people, be very alone. He craves human touch and that's why he says, "Kiss me, Hardy." before apparently, overcome with emotion, he leaves the scene. Not long afterwards, Nelson died. and afterwards he must have almost achieved superstar status. before the rest of the procession has finished leaving Whitehall. In 1922, HMS Victory was placed into dry dock. -Here we are. This is off the beaten track. -OK, let's do it. Our last items. -This is sad, isn't it? Here we go. I'm ready for it, Phil, are you? -Well, my eyes are watering, but, yeah, let's go. -Come on, darling, after you. -Hello, you must be Jo. -I'm Tasha. Lovely to meet you. -Jo, we met before. How are you? -Philip! Great to see you. -Does that mean he's going to get a better deal than I am? -Just old friends, old friends. -That's not hard, is it? To be fair. -Are you going to take that? -I can't argue with him, really. Packed to the rafters with goodies. So, what's going to tickle Natasha's fancy in here then? OK, so, ghouls to the front. They're not hand-painted, right? They're transferred on. -Is the colour done by hand? OK, so hand-finished I guess we can say. but that looks like a post-1930s mark, doesn't it? It's quite crisp. This is very 1930s but of course it could be as late as 1950. Oh, look! "A Dorset Litany. From ghoulies & ghosties..."
"and things that go bump in the night - Good Lord deliver us." -That's got a real nice Scottish feel to it. Ghoulies and ghosties. Oh, my goodness. I've met a few of those up north, believe me. It's marked up at £50, which scares me a little bit. Not as much as the ghoulies and ghosties, which are terrifying. -Do you want a tempting price though? -A tempting price? Oh, I don't know. -30. That's quite a chunk off. that is a very generous offer, Jo. Phil is just eavesdropping. He's so bad! but it's my last chance to be cheeky, of £20? I'm going to put it down carefully and say, "Jo, thank you so much." Because at £25 it does have a real chance, doesn't it? I think it's got a real good chance. Well, it won't be long before we find out. Now, has Phil found anything? No, it couldn't be. As tables go, that's not what you're looking for. Those leather chairs look a bit more stable though. and if you lean back on a chair, it breaks there. cos that is just not a good thing. he'd be willing to drop to 60. Wow. I know that you've said these at 60. 60, that is too much for me. Can you come down any more at all? and I really, really like these. I've also got another question to ask you. If I buy them, have you got any polish? -As long as you don't want me to do them. What do you think these would make at auction honestly? Can you do them for 40 and a bit of polish and I'll shake your hand? How about 50 and a bit of polish? I'll even help you if you like. No, no, I'll do it on my own. 45 and I'll do it myself. -You're a gentleman, Jo. Thank you very much indeed. to prepare them for the auction. is a bit like me really, it needs feeding. Thanks for the insight, Phil. With that last buy, it means our Road Trippers are all bought up. Natasha spent £120 on five lots. and the ghoulish Carlton mug. and the pair of newly buffed up leather chairs. What do they make of each other's lots? with that Carlton Ware mug. I think it's a cool thing but at £25, it might be a problem. But if it's rare, it should just see it through. with a huge spherical gate finial and a pig's trough. My pig item is a little ceramic dainty thing, his is a pig's trough. You are a such a fake grump! You're the fakest grump I've ever met in my entire life. No, I like being miserable. And you're just like, "Oh, I'm Philip Serrell. I'm so grumpy. "because I'm a grumpy man." No, you're not. -You are the nicest guy of all time. -Oh, get out of here. I think, "infectious, bubbly Natasha". -That's what I'm going to miss. -I'm not infectious. That sounds awful! -You are because you've actually made me smile. On that bombshell, it's auction time. The final sale is taking place at Netherhampton Salerooms. Presiding over today's events is Richard Petty. What does he make of our experts' lots? which may put some people off. £80-£100 perhaps, but it needs a bit of work. I would buy the pig trough because I think it's an interesting piece. It would look absolutely fabulous in my garden for the plants. Sadly, I have no pigs. Some good buys on both sides then. Right, on with the auction. Here we go indeed. First up - Phil's mahogany tray. 22, 25 from me. 25 my bid. 32, 35, 38, £40 from me. -..In the room then at 45. Anybody else? Being sold this time at £45. First lot and he's pulled in a profit. Well done, Philip. -That is a good start. Can Natasha's ghoulish mug keep up the profits? 45. Gentleman's bid then at 45. 48. On my left at 48. Anyone else want to join in? At 48. Being sold this time then at £48. That's some profit on the mug. Nicely done, Natasha. But will her Bakelite Scottie dog napkin holders prove as popular? Maybe they'll fly and do really well. -Who's got 10? Thank you, £10 I've got. -Who else wants it? £12. -I want them. I want them. -..£20. At £20. Gentleman's bid at £20. -£20, £20, 20. Anyone else want them at 20? Shout if we don't see you. Being sold this time then at £20. The Scottie doggies have done our Scottish lass proud. That's good. That's good, that's good, that's good. Double the money. -Right, Phil, the battle is well and truly on. Up next is your set of boat steps. I've got three lots of instructions. 45. I've got 50. 55. I've got 60. Another one for you? 65. I've got 70. -You know, that's a result, as far as I'm concerned. Oh, keep going. Someone's got to come in. Got to. Last chance. Being sold this time then at £70. -Oh, Phil, that was close! Ah, a bit of a loss there. Someone in Salisbury got a great deal. Natasha's still in pole position at this auction. Can she edge further ahead with the piggy hatpin holder? -I really am in trouble here. £50. Lady's bid then at £50. Anyone else at 50? Your last chance. -Being sold this time then at £50. You could well be right, Phil. A fantastic return on that little piggy. The bookcase is up next. are forward planning. Bonfire Night is not that far away. -100? 70 or 80? 50 if we have to. It's here to be sold. -Who's got 50? Thank you. -I just cannot believe that. Join in when you're ready but be very, very quick. 55. -That chap thought he said 15. -..85. Don't think tomorrow. Tomorrow will be too late. 85. 85. Anybody else? Being sold this time then at £85. Fantastic! Now that's a profit! That is a top job, isn't it? I'm so glad that someone else saw what I saw in it, Phil. Someone else had the vision that you just simply lack. Yeah. I'm going to go get all the books out and start again, I think. Well done, you. Well done, you. you need to make a profit with your pig trough and garden ball. Would it have been useful if you'd had two gate finials, do you reckon? I would never have bought them. They'd be a couple hundred pounds. -What do you want with one finial? -Who's ever going to buy one finial? Is there a guy with half a house or...? I need to start the bidding at £35. 35 I've got. 35, 35, 40. 45, 50, 55, 60, 65 with me. 65. The bid's with me at 65. How's the phone looking, Gem? -I think he's got the speaking clock. I think he's gone out. -Oh, they're out. They're out. -65. Is he back in yet? -Oh, no, he's gone out to the shops! He shakes his head. At £65. -75, 80. Now I'm out. 80 in the seats then. £80. 80, your last chance. Anybody else? Being sold this time then at £80. -That is so good. £80. Phil's random garden lot has put him back in the game. Great stuff! Edge of your seat stuff here. Can Phil bag another profit with his pair of buffed up leather chairs? Who's got £20 then? Here to be sold. Who's got 20? -It's all go, it's all go. 25. -..28, £30. £30 I have then. 42? 42? What a shame. 42. Anybody else got 42? -One more. Help this man break even. after all that effort I put in polishing the wretched things. wasn't an entire waste of time. And now for Natasha's final lot. The romance of a cellarette is going to set this saleroom on fire. -Come on. No, no, no! -Anybody else want in at £40? -No, I don't. Drop the hammer. A small loss there, but Natasha's still in the lead. that that was probably worth a bit more than that, wasn't it? -cos so many things today have made money that I did not expect to make money. Phil will need a romping result on the rocking chair. 32. 32. Anybody else at 32? Your last chance on this lot. So, there we have it. This week-long Road Trip ends on a profit. What a brilliant week we've had, haven't we? It's been so good. It's been so good. -Shall we go outside and have a little cry? -The winner drives us off. Come on, Philip. Well, we'd better find out who that winner is then. with a final total of £244.90. he suffered a little loss of £9.42. with a fabulous final tally of £315.98. All profits go to Children in Need. -Well, yeah, but you won the evening. It doesn't matter. The winner overall drives away. No tears, no tears. It's too good. It's too good! What a week it's been for a perfect new partnership. You and I can be Tom Cruise and Kelly McGillis. and happiness absolutely wears me out. than driving in a gorgeous Porsche with a handsome man like you. Oh, what a girl! What a girl! ..and a whole lot of laughter. -You're a lot older than me. -I hope I haven't shot myself. -This looks like a female bottom. On the last day on Natasha Raskin and Philip Serrell's road trip, they cover Berkshire and Hampshire, but who will win the week at the final auction in Salisbury, Wiltshire?